As any good teacher knows, no two learners are alike. Fortunately, professors and community college instructors have more tools than ever to help reach all types of students. Online learning comes with interactive modules and engaging video components that take learning far beyond what traditional textbooks can offer. In particular, video can offer “visual clues” that stimulate memory and problem solving, accelerating the learning process and helping students to deepen their understanding of the topics you teach. Researchers have also found that video’s unique blend of audio and visual cues can help students absorb new information most efficiently. Spark Discussion: Break up your lecture with a short video and use it as a jumping off point for discussion. Have pairs tell each other what they think, and then have those pairs combine into groups of four to six to work through post-video questions. You can be a “guide on the side” instead of the leader for a change of pace. Hands-on Practice: Interactive modules are especially useful in computer classes, where navigating through drop-down menus on Word or Excel will help your students learn the program far more quickly than just reading about it. Have students pull up practice modules on their laptops to try a skill while you’re still there to clear up misconceptions to accelerate their understanding on the spot. Flipped Classrooms: Video and other online learning modules make it easier than ever “flip” the learning model. Instead of using classroom time to explain a new concept and send students home to practice it, try having them watch a video at home first. When they get to class, you can use your time to answer questions and practice the new skill, which is often a much more efficient use of everyone’s time. Researchers have spent years trying to figure out what makes students tick, and the result is the theory of learning styles that describe sensory modes for absorbing new information. By offering video and web learning, you can help reach students who prefer to learn in different ways. For example, visual learners reap the benefits of videos and web graphics when they shift to online textbooks. They can efficiently scan the page to click on the diagram or chart that supports the text and even pull it up into a popup window for continual reference as they read. 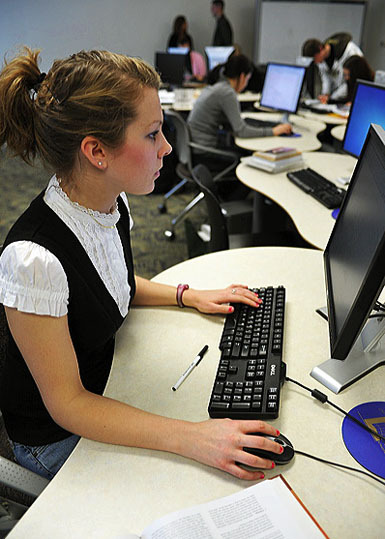 Videos with demonstrations that show people using a computer program or solving a problem serve as a high-speed highway of information absorption for these learners. Online learning also addresses auditory and kinesthetic learners’ needs. Video helps auditory learners absorb material, especially if it’s a recorded lecture with a professor’s voice explaining material. These learners can listen to in-depth discussions and take notes without ever looking up — or they can simply pause or rewind when they need to review a detail. Kinesthetic learners master new concepts by touch and manipulation, so they love to interact with computer programs like Microsoft Office and QuickBooks. An interactive web module allows students to try their hands at using the software as they learn, making it the ultimate hands-on approach. Accessing material in a range of ways helps the brain create additional neural pathways, which reinforces learning and allows the brain to retrieve long-term memories more easily. Using a judicious combination of text, video, interactive resources and the teacher’s human touch is the best way to enhance learning and reach students of all types. Want to learn more about interactive online textbooks that will enhance your teaching of business and computer courses? Contact Labyrinth Learning to see the latest programs for Microsoft Office applications, Payroll Accounting, QuickBooks and more. The California Office of Correctional Education (OCE) is seeking educators for a variety of positions. The OCE adult schools serve several thousand California state inmates each day by providing programming in Adult Basic Education, High School Equivalency, Voluntary Education Program, and Career Technical Education. Libraries offer materials to support inmate employment, community reentry and life skills. The libraries also provide legal resources and recreational and educational materials at each prison. OCE programming includes face to face college classes, distant education, recreation services, educational television programming and community transition planning. Brian Favro of Labyrinth Learning recently saw firsthand how the Office of Correctional Education is transforming the state prison system when he attended the inauguration ceremony of the San Quentin Machine Shop. This innovative program is one of several using education and job training to give inmates a greater chance of getting and retaining a job once outside the prison walls, thereby lowering their chances of returning to prison. The San Quentin Machine Shop and the Last Mile (https://thelastmile.org/) are just two examples of the types of programs being delivered by the Office of Correctional Education. Watch the videos below to be inspired by the difference these programs are making.